I like to hear that you’re getting some good playing time. I’m glad that you are learning a lot about patience, and trying not to rush into things. I’m learning the same thing in volleyball. When I get up to serve,I try not to just throw the ball up and hit it, I take my time and bounce the ball a little bit. Then I toss it up, extend my arm, and snap my wrist to get nice top spin. When I ace it makes me feel real good because I’m a one handed player who’s playing against girls who have two sides to play with. So patience is key, and should be kept in mind when playing all sports. Reading about what you go through and learn every day inspires me to be patient when I am playing sports. Keep up the hard work and positive attitude because it never goes unnoticed. I really enjoy the blog. I’m a Bell from 1984 and have asked a lot of folks about you and have yet to find someone say anything except that you are genuine and what you see is what you get. Everything I’ve seen is worth watching and using as an example to my kids. Thanks for that. Can you talk about the difference mentally about when you are playing the way you want to and when you scuffle? I did not play at a high level but when things were going well, it was almost an out of body experience – see ball, hit ball. As long as I did my preparation during the week, the games took care of themselves. When I scuffled, I found I usually overthought everything. Have you ever seen that at your level? Keep up the good work. I think it would be great to have you up in the bigs for a full season, playing every day. I just hope management is patient enough. I’ve been in AZ for a week now, watching the Scorpions play, and have to say I am VERY impressed watching you. For those who can’t see you play every day, your patience at the plate has been great (and you were totally take advantage of by the HP ump yesterday!!). I am really enjoying watching the agresssiveness you show in baserunning. But most of all, I am intrigued by your fielding. It looks like you really picked up a lot watching and playing with Omar this past season…I see some of that coming out when you play shortstop. So ignore the negative comments from people who are reading stats and not watching you play! Do what you came to AZ to do! See you at the yard! Hope next time you write you don’t sound as upset as you did here regarding people looking at stats! I think what you’re doing is right on track, getting your patience together at the plate polishing your skills on the field. Is no hidden news that Durham may not be resigned next year for money issues, and your determinism to be better and work on your flaws only shows that you’re getting prepared to what could be your first year as a full time player for the Giants. Keep letting us know how your progress is going, is fun to read about baseball when the regular season is over. The previous post mentioned some great plays by you that reflect your attention to the way Omar plays.. are you more comfortable playing second or shortstop? Keep up the great work! – little fact: i was born the same day-year you were, so i know the determination and will to get to where you want will get you anywhere! I hope Arizona?s treating you well. How?s your jaw doing? I just wanted to tell you how much I enjoyed watching you play this last season. I?m impressed with how you play 110% no matter what and how your uniform is always dirty at the end of the game. I play exactly that way too; if my uniform isn?t dirty by the end of the game I believe that I didn?t play hard enough or to my ability. I?ve been playing softball for 10 years on both a school team and traveling ?A? ball team. Don?t worry about the stats, of course people are going to look at them and think what they want, but I have learned that it doesn?t matter what they think and that the only thing that truly matters is that you can look back and say that you helped your team in someway and that you can learn from your mistakes and/ or errors. To me stats just show what you did summed up in numbers, but it doesn?t show how hard you play the game and how you got out. So, just hang in there? play your game and don?t worry about what people are saying. I?m glad to see that you went into the AFL with some goals and I truly hope you reach them this winter. **Keep up the great work!!! I am a Giants’ fan since they moved west and a season ticket holder for 23 years. Since I retired, I have been following baseball from Scottsdale to San Francisco and back again. I have been in Arizona watching you play this entire AFL season, and will be here until after the Championship game on the 18th. By the time the AFL season is over, I will have seen some 140 games this year involving players in the Giants organization. Not to blow my own horn, but I believe I was the first person to say you remind me of Robby Thonpson when I first saw you play in Spring Training in 2005. Robby was my all-time favorite Giants second baseman so that is high praise. I have high hopes for your future contributions to the big club. I do have a question for you (tongue in cheek of course) since you went 4 for 4 with a walk on Saturday the 21st…..and raised your batting average to .360, not to mention your OBP to .500……do you still feel the same way about batting in the high .300’s not being all that important? At any rate, that should quiet the critics for a day or two. Also, I noticed that it looked like you jambed your thumb when you attempted the steal of 3B. I see you had it taped when you returned to the field. Is it OK. Are you going to miss any games because of it? I am sure all baseball fans appreciate you taking the time to communicate with us like this. Thank you and keep up the good work! I wish you the best of luck playing for the Scorpions. Hopefully you will improve your skills without getting hurt again! 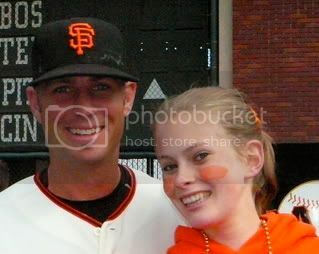 Even though I would like to see you back in Fresno next year, the Giants will need a strong infielder like yourself. Keep up the good work! I really enjoyed watching you play this past season and seeing you go back and forth from minor to major was not good. I feel that the Giants organization need to permanently keep you on the roster and keep you playing. I hope you have a good season with your team and I hope to see you on the starting roster come April! Your all-out style of play is really appreciated by Giants fans. Hope to see you getting some (or all) starts at 2B next year…. well because I played second in HS & my name is Kevin so you’re living my dream! Give it back! 😉 Keep up the good work. It was great to get a chance to talk to you at the game on Tuesday. Thanks again for the autographs…those were very special. And your game at Mesa on Wednesday was AMAZING!! Congrats! I hope your AFL experience this year is everything you want it to be, and that your goal is achieved! Believe me–many of us are hoping that too! And like I told you–stop reading the message boards!! My name is Emily and I play fastpitch softball and I broke my jaw just last week getting hit by a pitch. I now have it wired shut and have to eat everything through a straw! It is definitely not fun. I was wondering if you had any advice or anything you could tell me about how you survived. If you could e-mail me back that would be awsome. If not, I hope you have a good winter and look forward to seeing you in San Francisco next season! I am glad to hear that you had a great game on Wednesday. I cant wait to see you play a full season with the Giants. I wish the rest of the team would give a 110% on every play like you do. anyways good luck and see you on opening day! Congrats on being named to the Rising Stars Game roster!! Way to go!! Oh yeah, are you going to be at the Fan Fest? If you are, then I can`t wait! Congrats on a great game today! 5 for 5, 4 RBI, home run on the first pitch in the 7th?!?! I’d say you are DEFINITELY doing what you came to do. Sorry I only got to watch you play for two weeks!! Keep up the good work!! Glad to see that the critics are being hushed. But then again consistency always defeats impulse. I’m sure we’ll all see you in the starting lineup come spring. Just to let you know, we watched the last game of the season over at your cousins…it’s pretty cool to see how proud of you they are. We were hoping to see you play against LA, but missed it by a day. Good luck with the rest of the AFL…keep tearing it up. Congrats on winning the Stenson Award. You are SO deserving of that honor. And congrats on a truly stunning AFL season. It was great being able to watch you play for two weeks, and to keep up with your progress for the rest of the time! Hope you have time for a rest now before Spring Training! Look forward to watching you play next season. Kevin you are the **** man. I love the way you played when you came in last year and i expect great things from you in the future. I know we just got ray for 2 more years but he is injury prone and i think you’ll get some more playing time this upcoming season. i love the way you play kid. keep it up. Glad to hear the the AFL went well. I hope you enjoy your time off back home. Speaking of home, are you going to play in the Spartan Alumni game this year? Sure would be fun to see you out there in Blue again! Keep up the good work, and stay healthy! Hang in there on those 2 strike sliders. I got a chance to see you at the Giants Fan Fest last month and wanted to wish you well in 2007. It was great to hear you answer questions and seem pretty happy to be there (with Barry Z. no less). Wanted to know what you most look forward to after Spring Training, something not so obvious like being able to play, but something we wouldn’t know about? Hi Kevin,Last year my girl friend I saw you having dinner with your family after your first game in the show. You had a ball drop you did not run out.you seemed to be a little upset. we wanted you to know that we believed in your abilty and you are going to be a great Giant for years to come. My girl friend wanted to say that to you that day,but thought it would be rude to bother your dinner,so I am telling you this now. Keep up the hard work. We think your great. Michael in Oroville,Ca. Is anyone concerned that the Giants signed Barry Zito to the highest contract for a pitcher in MLB history?It is well documented by every scout in the league Zito’s fastball averages a marginal minor league 86 mph? Hey I like Zito. He is a great guy, but after throwing 200+ innings for 6 years in a row his arm appears to be more like a retired Kirk “Woody” Reuter than an ace starter. The Giants could have signed Jason Schmidt for 3 years at $48 million and he still throws 97 mph with the best change-up in the league. And now the division rival Dodgers have him. When is the ownership going to realistically invest in a World Series caliber team to satisfy fans that supply one of the league leading attendances (3 million plus a season)? Would be nice to see them actually win it all before I die. 1954 was a long time ago. Look for low run production in 2007. Giants never really recovered the offense in the lineup after losing Jeff Kent. Dodgers have more production from ex-Giants than the Giants do now. Why not swallow some pride and hire back Dusty Baker? Maybe Baker won’t play for the Giants? Now the Giants have a manager who possibly won’t make it through the end of the season? Last week he left Bonds in the game on second base in the bottom of the 8th when the Giants are one run down. Result is the Giants had no chance of scoring the tying run on a base hit with Bonds’ knees. Then Bonds fails to catch a foul ball in the 9th, for fear of running into the left field wall on knees that can’t stop him fast enough, which would have helped end the inning without further damage. Teams around the league have a sure fire scouting report on how to beat the Giants. It’s no secret. Giants need real players who have proved they can still produce. But then again why should they build a team when they will get 3 million in attendance regardless and continue to profit on a sub-par team, lower payroll team and payoff their stadium debt. frannie you need to post a new blog sometime soon. the last one was like 6 months ago. we miss you in the bigs and I hope that you come back up by friday!!!! I recently discovered that you were brothers with DJ and that he passed away in 2004. I actually played tennis with DJ at ASRC for many years, and am very saddened to hear this – I had absolutely no idea he had any illness. Most of all, I am really sad that I never got a chance to say goodbye to him. All that I have read about him is true – that he was always upbeat and enjoying life, one of those guys that was just constantly smiling even as he spoke. Anyway, I wish you the best of luck in your career, and please tell DJ I said hi. Hey cutie! I saw you had a blog and had a couple things I thought I would mention. First of all, congrats on your graduation from SJSU! A good friend of mine graduated with your class. But back to baseball…a few weeks back (I should’ve written this sooner because now I’ve forgotten which game it was), you guys were down fairly late in the game. Giants started to rally and they showed the reaction of the dugout. You were so excited, jumping and trying to see what was going on. All the other players were leaning on the fence, seemingly unamused. Kruk and Kuip even joked about you having “the exuberance of a rookie”. That’s when I realized what the team is missing. It’s not a matter of offense or defense, not even pitching. It seems as though a lot of our players have lost the spirit of the game. It’s really sad to see these guys who have been around baseball so long that they’ve lost their energy. It was such a breath of fresh air to see that light in you. Keep that energy going…it’s fun for us at home to watch, and believe it or not, it is contagious to the guy sitting next to you. Wow! So now I know who I was talking to in the St. Louis Starbucks. I figured you were connected to San Fran in some way and I am big on not making a big deal over it (’cause I’m all cool like that)!…. So I come home (to Tennessee), search the Giants active roster, and lo and behold there you are! The red bracelet that I spotted on your arm also helped me verify that it was indeed Kevin Frandsen. So there I have it….mystery solved….inspiration begins… Your life story has touched my heart and your humility is amazing. What a great example you are!! I didn’t know you had a MLB Blog. It seems you haven’t updated for a while. How’s life, your season, etc.? Congratualtions on graduating! Its great to see so many baseball players understanding the importance of education. By the way, what did you major in. P.S. I noticed you have a lot of enthusiasm on the field. Never loose that. Have a great season, summer, and season. Hope to talk to you sometime. Kevin… Congrats on the season! Specially on the HR today in LA! You’re an amazing player! Dear Kevin, stop grounding out to short. That is all. i was wondering if you were going to attend the bellarmine memorial in honor of your brother or will you still be playing in the AFL? Hey Kevin.Listen I just wanted to let you know that more and more evidence is being obtained in regards to the Giants being a “puppet” organization.We have ignored these rumors for to long.A lot of links show the dodgers as the true owners of the team.Although most of the evidence shows that they own the Giants through some other corporation a lot of evidence states that they are in fact the true owners of the team.The evidence points to 1975 so far.That is when Stoneham sold the team.If you analyze the stupidity surrounding the team since then and have the evidence we have a lot of things will start to make sense.I have rooted for the Giants just like you.I always asked myself how such a great and most of the time overpowering team from New York could end up like this.The only thing worse than the San Francisco Giants are the brooklyn dodgers.That is what the dodgers organization especially that fat,Java the Hut looking,parasite infested lasorda has wanted for a long time.After all these years the brooklyn losers are still jealous of not only the New York Giants legacy but of their fans.The dodgers have always been envious of the Giants,of their fame and their fans.All evidence shows that they are working hard to turn the San Francisco Giants into the brooklyn dodgers.We need help from people like you to make this known to the media. Don’t let apathy bring you down.It is something that has lingered in the Giants’ clubhouse ever since they haven’t been legitimately owned.Spread the word to the rest of your fellow young Giants who are trying to make the Opening Day roster.The truth is that when an organization is stupid enough to hire Bruce Bochy as a manager,keep Dave Righetti as a pitching coach,send top prospects such as Scheirholtz and Denker to the Minors and exclude them from the Opening Day roster,sign and keep old broken down bums like Roberts,Durham,Aurilia,Kline and Vizquel,keep a weakling like Winn on the roster,and keep Brian Sabean as a general manager(without mentioning the stupid trades that have gone on throughout the years like Ainsworth-Ponson,Nathan-perzynski,Accardo-??? ?,etc.,the break up of the 2002 Natoinal League Champion team[the most stupidest of all moves by Brian Sabean so far],the signing of bonds in 2005,the signing of Ray Durham in 2006[does that guy even know what sport he’s playing? ],and the signing of Benitez)there’s something behind it and we all know what it is. At the right moment we will make this known to everybody. It is a shame that the Giants don’t let their young talented players develop.Mel Ott was 16 when John McGraw put him on the New York Giants Roster and look at what he did.Why?Because not only did John McGraw care about baseball and the Giants he cared about young talent.He strived to either permit,help or watch it develop.He would show patience. Hang in there.We would hate to see you go anywhere else.We hope that you don’t.But we also feel that you should know the truth.